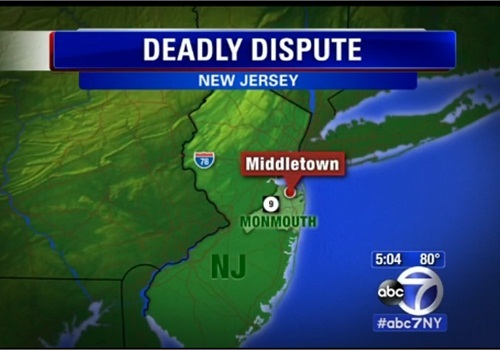 Authorities are investigating the circumstances surrounding a police-involved shooting early Wednesday morning in Middletown Township, N.J., in which a member of the Monmouth County Emergency Response Team fatally shot a man who allegedly was armed with a knife and holding his 13-month-old son hostage in his home following a domestic dispute, reports WABC-TV. Officials say the events leading to the shooting started around 11:30 p.m. Tuesday, when the Middletown Township Police Department responded to a 911 call reporting a domestic dispute at the house. When officers arrived, police say the mother of the child had fled from the house. She reported that 39-year-old Scott McAllister was intoxicated and had beaten her, and that he was armed with a knife and threatening to harm their child. McAllister was reportedly locked inside the house with the couple's toddler son and refused to allow the police to enter. After five hours of negotiations, at approximately 4:30 a.m., the SWAT team forced entry into the house, where they encountered McAllister, who is believed to have been armed with a knife. One member of the team fired at McAllister, fatally wounding him. The child, who was near McAllister, was not harmed.